Our Pet Photography Classes are held once a year in our Mobile Studio in Clearwater, Florida or while shooting throughout the United States. The class is in late June or early July each year. Classes begin at 9 am and run until 7pm each day for 3 days! You will be tested on what you have learned and you will complete two photo sessions using Real Pets. Each pet will be photographed separate and both together! You must pass this TEST SHOOT and satisfy the owner of the pets with their pets photographs. 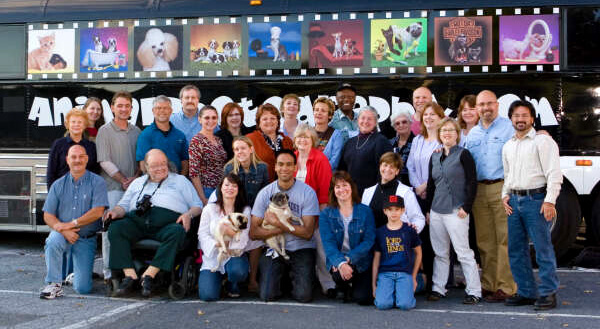 You then will receive a certificate of completion confirming your new title of CPP “certified pet photographer”. You will also, within time be able to become a “master certified pet photographer” with an accumulation of 1000 pet portrait sessions and 100 submitted images showing that you have mastered photographing pets. During the Four days you will photograph pets using our state-of-art equipment and studio. We will teach you timing and assist you on how to work with the pets. You will be given Ren’s book, Pet Portraiture Made Easy. This book alone has over 29 years of knowledge and over twenty chapters of Dog and Cat photography ideas, tricks, and solutions to the challenges and situations you WILL encounter photographing pets. There are even a few tricks on dealing with people! Along with that, you will be trained in professional pet portrait lighting. You will be taught how to use a digital camera and how to print digital prints using the latest Photoshop techniques and printers. Ren will show you his table specifically designed for photographing pets, and even assist you in building your own. We will work with you to create a list of equipment that you will need to start your own pet photography business. The “Tricks-of-the-Trade,” included in Rens book, will be demonstrated and discussed in length. Ren will show you every product he uses to complete an order. This will include every company name, address and phone number where he purchases these products. 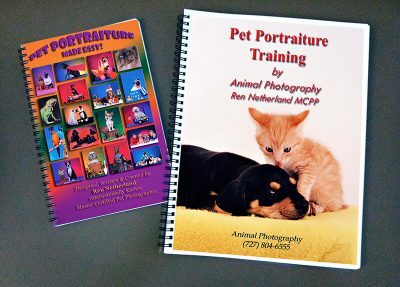 This includes things like; software, invoices, paper, ink, props, backgrounds etc… You will leave this class with more knowledge of pet photography than you ever expected, you will learn in days what took Ren 29 years to learn and accumulate. Ren is also including in the class his 46 page work book!